TME's offer has been enriched by the latest series of Dual G2 High-Power Motor Drivers from POLOLU. 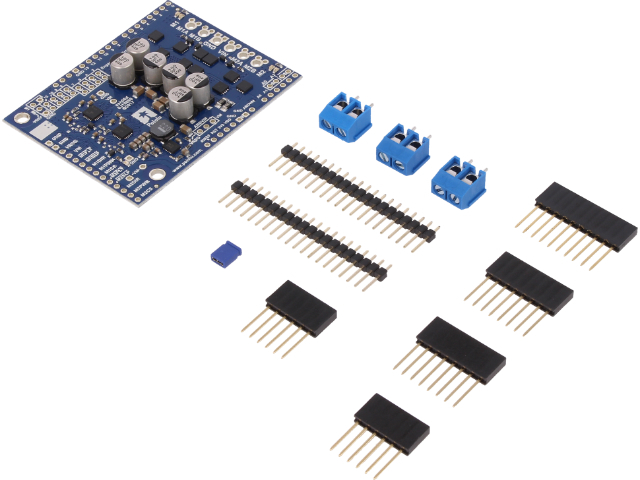 Each module features two H-bridges enabling DC motor control. The boards offer pins that match the Arduino standard. Additionally, the manufacturer has routed all the necessary signals to an additional strip of terminals. Thanks to that, the modules can be used in projects that are not based on Arduino. Depending on the actual version, the motor drivers can support voltages of up to 28V. In the most powerful versions of the module, the maximum continuous output current can reach up to 22A (at 18V) or 18A (at 28V). The drivers also feature a built-in step-down regulator for limiting the voltage to 7.5V (1A), which can be used for powering Arduino.